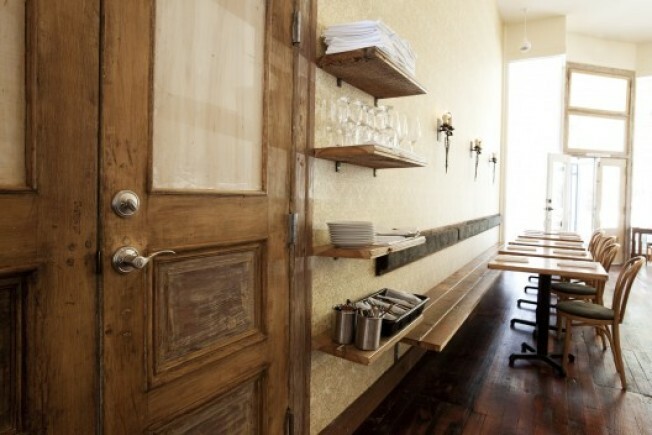 Here we are inside Heirloom Café, the historic charmer that just opened Tuesday night on the corner of Folsom and 21st. Owner Matt Straus has been working at "fancy, high end restaurants for years," including Jardiniere and RN74 here in San Francisco; and he's been dreaming up Heirloom all the while. You see Straus wants to fill the gaps he's identified in dining. And he's starting with his wine cellar, storing vintages from the likes of Qupé and Havens, many of which hover at around $100 a bottle. Meanwhile by-the-glass offerings range from $8-22. On top of this, he's serving an affordable menu of Euro peasant-meets-California food, so he can fulfill his other dream of eating a NY steak with a cherished Grand Cru. Heirloom Café will be open Monday through Saturday from 6 until 10 p.m. and will start serving Friday and Saturday lunch next week. Grab the full wine and food menus on the website.